Tucked away on the upper floor of Dubai Herbal & Treatment Centre, Eat Well Restaurant is truly a hidden gem for health-driven diners. Wellness is at the core of everything served at Eat Well, and while many healthy eating venues across the city fall short when it comes to delivering nutritional food that’s also packed with flavour and temping to the eye, Eat Well certainly does not. 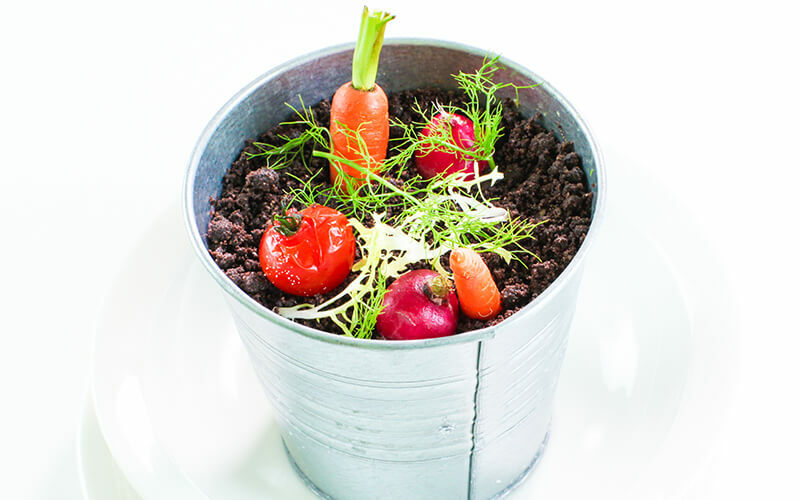 All meals prepared at Eat Well are specially designed by the restaurant’s Wellness Chef, who tries and tests dishes again and again till flavour combinations are perfected using only the most nutrient-rich ingredients that are organic, seasonal and locally-sourced responsible suppliers. Most of the dishes served are gluten and dairy free, plus free from refined sugars. The team is also able to tailor meals and meal plans to cater to paleo, vegetarian and vegan diet requirements, plus any other intolerances or allergies a diner may have. Although we’re here to check out the lunchtime offering, Eat Well is also open for breakfast, lunch, dinner and Friday brunch, with a special vegan menu and specials board to accompany. The restaurant also creates tailor-made meal plans that are delivered daily to homes and offices, to help its customers stay on track. Our experience begins with starter highlights of vegan tartare, made up of tiny cubes of watermelon and tomato mixed together, on a bed of avocado perfectly marinated with a tough of mustard, aged balsamic and parsley oil. This dish really impressed me and surprised me with how good it was, as did the ‘bang bang shrimps’, which came lightly battered and served in lettuce cups and seasoned with honey mayo, pepper ketchup sauce. For mains, we devoured the perfectly cooked oven-baked salmon with beetroot puree, red pepper coulis, carrots, asparagus and Brussel sprouts. The dish packed so much flavour and the salmon was tender, juicy and beautifully seared. 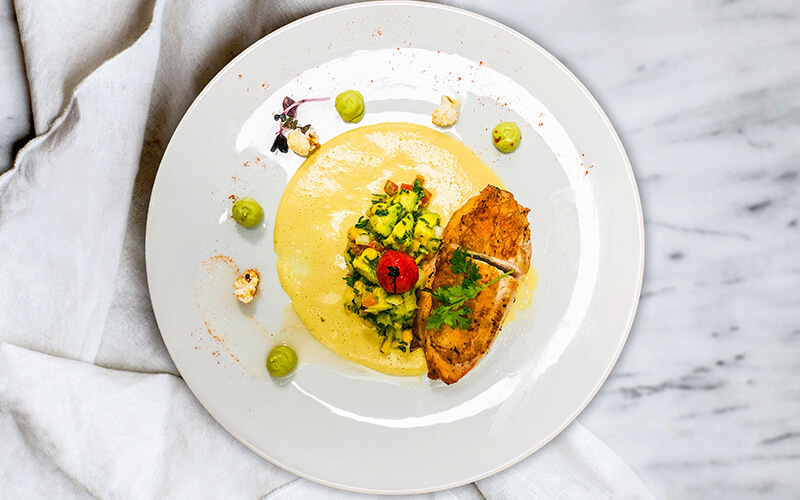 The corn and chicken with avocado salsa was also a great dish, served with a corn puree made up of coconut cream and corn, simply blended and seasoned to finish the dish off superbly. For dessert, there’s a fantastic range of indulgent options that come without the guilt – who ever said you can’t have your cake and eat it too? The sweet potato brownie and beetroot ice cream stole the show with it’s deep chocolaty flavours perfectly married with the sweetness of beetroot ice cream. To accompany lunch, a generous drinks menu offers refreshing beverages such as herbal infusions, water infusions (the immune boosting blend is lovely with pinapple, strawberry and orange), juices, smoothies, health shots and herbal teas and coffees. Service is fantastic at Eat Well. Expect professionalism, attention to detail and service with a smile. Eat Well is a great place to enjoy highly-nutritious food that doesn’t lack in flavour. My dining partner and I could hardly believe that what we were eating was ‘healthy’, as it was so good. It’s a great spot for a post-gym bite, a healthy meal or to head to discuss a weekly or monthly meal plan. Each week, the venue also hosts a healthy brunch on Fridays from 11.30am to 3.30pm, which is perfect for the whole family – there’s even a dedicated children’s room with professional caretakers to keep the little ones entertained. Details: For more information or to make a reservation, call 054 476 6326 or e-mail info@dubaieatwell.com. If you enjoyed this article, you may be interested in reading more about Eat Well’s offerings here.